The mystery, color and romance of pre-war North Africa comes to life in Casablanca style. Inspired by the Moorish architecture of Spain, Morocco and Tunisia, Casablanca incorporates the classic design elements of Moorish-style arches, loggias, courtyards, and window openings, creating a style reminiscent of the grand stone, tile and clay architecture of the western Mediterranean. 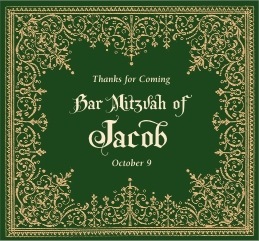 The font, with its boldness and embellishments, evokes the moorish calligraphy of the mediterranean. 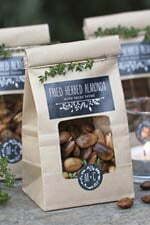 This is a style for a sun-drenched outdoor garden party or other event. 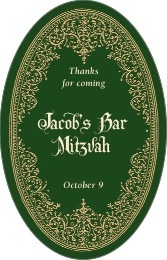 Customize your Casablanca bar/bat mitzvah labels for your bar mitzvah or bat mitzvah today. 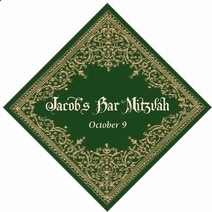 Casablanca Bar Mitzvah labels are printed on your choice of coated paper or waterproof vinyl label stock. 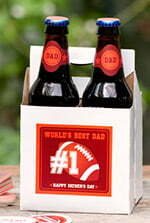 Both print with fine detail and rich color, and are easy to apply. 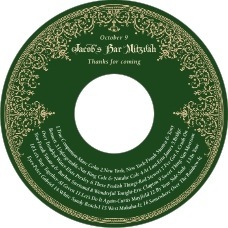 The vinyl labels are also very easy to remove, and the square vinyl shapes are even re-usable when they are on glass or metal. Just peel them off starting at a corner and pull slowly then save them for another time by putting them back on their carrier sheet. 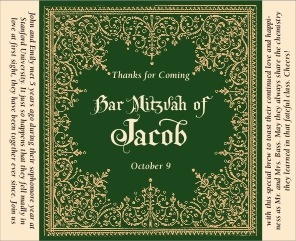 Click on the "Personalize" button to begin customizing your Casablanca Bar Mitzvah labels with Evermine!